Legends of David and Solomon. Holy of Holies of the Temple at Jerusalem. Mount Moriah, on which the Temple was erected, is known by tradition as the spot where Adam was born and where he built an altar to God; where Cain and Abel offered their sacrifices; and where Noah built an altar after the Flood (Gen. viii. 20). Abraham offered Isaac as a sacrifice on this "mount of the Lord"(ib. xxii. 14); David purchased the spot from Araunah "to build an altar unto the Lord" (II Sam. xxiv. 21); and finally it was chosen as the site of the permanent altar in the Holy of Holies of Solomon's Temple (Maimonides, "Yad," Bet ha-Beḥirah, ii. 2). The stone on which rested the Ark of the Covenant was called "eben shetiyyah" = "the foundation-stone," on which the world was based (Yoma 54b). The west side of the mount was selected for the Temple site because the Shekinah rests in the west (B. B. 25a), and also in opposition to the rite of the heathen, who worship the sun in the east (Maimonides, "Moreh," iii. 45). Mount Moriah was allotted by Joshua to the tribes of Judah and Benjamin. The area of the mount, the halls, and the chambers of the courts were assigned to Judah; but the vestibule ("ulam"), the Hekal, and the Holy of Holies were built on the lot of Benjamin. However, a strip of land running into the Hekal, on which stood the altar, belonged to Judah. According to another authority, Jerusalem was not divided among the tribes, and Mount Moriah became their common property. 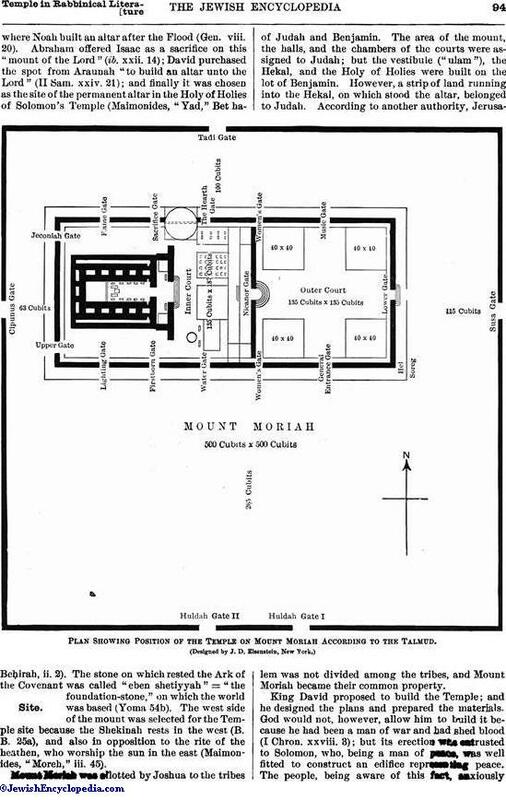 Plan Showing Position of the Temple on Mount Moriah According to the Talmud. 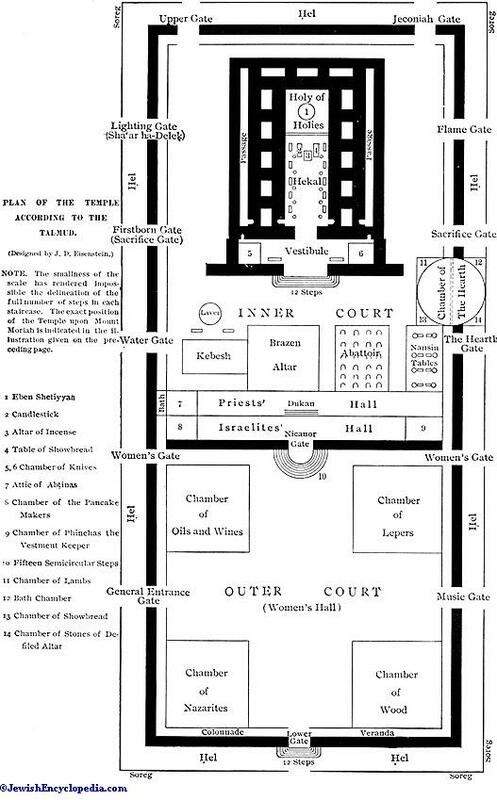 PLAN OF THE TEMPLE ACCORDING TO THE TALMUD. NOTE. The smallness of the scale has rendered impossible the delineation of the full number of steps in each staircase. 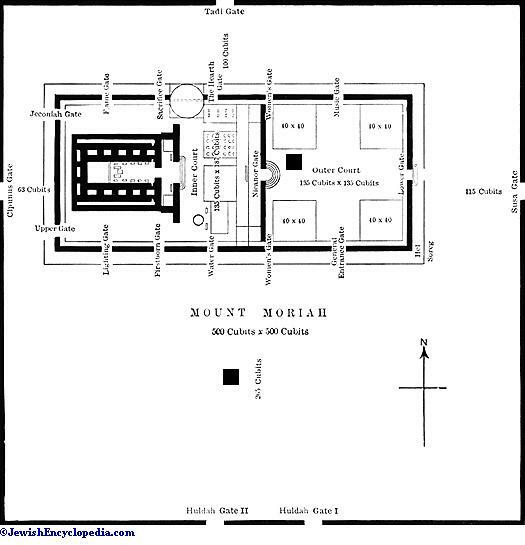 The exact position of the Temple upon Mount Moriah is indicated in the illustration given on the preceding page. King David proposed to build the Temple; and he designed the plans and prepared the materials. God would not, however, allow him to build it because he had been a man of war and had shed blood (I Chron. xxviii. 3); but its erection was entrusted to Solomon, who, being a man of peace, was well fitted to construct an edifice representing peace. The people, being aware of this fact, anxiously awaited Solomon's accession. A haggadah says David once overheard the people say: "How soon will the old man die, that his son may commence to build the Temple and we may visit the house of the Lord?" Their talk pleased David somewhat; and he chanted: "I was glad when they said unto me, Let us go into the house of the Lord" (Ps. cxxii. 1). The Almighty consoled David, assuring him that "A day in thy courts is better than a thousand" (ib. lxxxiv. 10); that is, God prefers one day of David's study of the Law in the courts of learning to 1,000 offerings of sacrifice in the Temple by Solomon (Mak. 10a). In the same sense Raba said: "One who is engaged in the study of the Law need bring neither a burnt offering, a sin-offering, nor a meal-offering" (Men. 110a), showing the tendency of the Talmudists to belittle the importance of sacrifices. David was apprehensive lest his enemies should assign his sin with Bath-sheba as the reason for God's refusal to allow him to build the Temple: he therefore appealed for divine intervention, praying, "Show me a token for good; that they which hate me may see it, and be ashamed" (Ps. lxxxvi. 17). God granted his wish when Solomon had finished the Temple and was about to bring in the Ark to the Holy of Holies. At this moment the doors slammed to and could not be opened. Solomon thereupon recited twenty-four hymns and cried: "Lift up your heads, O ye gates . . . ye everlasting doors; and the King of glory shall come in" (ib. xxiv. 7). But no response came. Finally he prayed, "O Lord God, turn not away the face of thine anointed: remember the mercies of David thy servant" (II Chron. vi. 42); and immediately the doors opened of themselves. Then the enemies of David were cast down, and their faces turned black, the people being convinced that the sin of David had been forgiven (Shab. 30a). Everything connected with the Temple is distinguished as "yedid" = "amiable," "beloved." A Talmudic epigram runs: "Solomon, who was named Jedidiah [= "God's beloved"; II Sam. xii. 25], had built the Temple [Tabernacle], referred to as 'amiable' [Ps. lxxxiv. 1] and situated in the lot of Benjamin 'the beloved' [Deut. xxxiii. 12], in honor of God, who is 'beloved' (Isa. v. 1], in order that the sins of Israel who is 'dearly beloved' [Jer. xii. 7] might be forgiven" (Men. 53, b). Through the agency of Ashmedai, Solomon acquired the Shamir, either a worm or an exceedingly hard stone, which hewed or cut with perfect ease all kinds of granite, marble, and glass necessary in building the Temple (Giṭ. 68b). Indeed, its mere touch cleft the hardest substance in existence (Soṭah 9a). In size the shamir was no larger than a grain; and it had been preserved since the Creation. R. Oshaya (Hoshaiah) declared that Solomon planted in the Temple various kinds of aromatic trees of gold, bearing fruit which, when the heathen entered the Temple, withered away, but which the Almighty will restore in the future Temple: "It shall blossom abundantly . . . the glory of Lebanon shall be given unto it" (Isa. xxxv. 2; Yoma 21b). "Lebanon" is the poetic name of the Temple, because the latter was built of cedars of Lebanon. 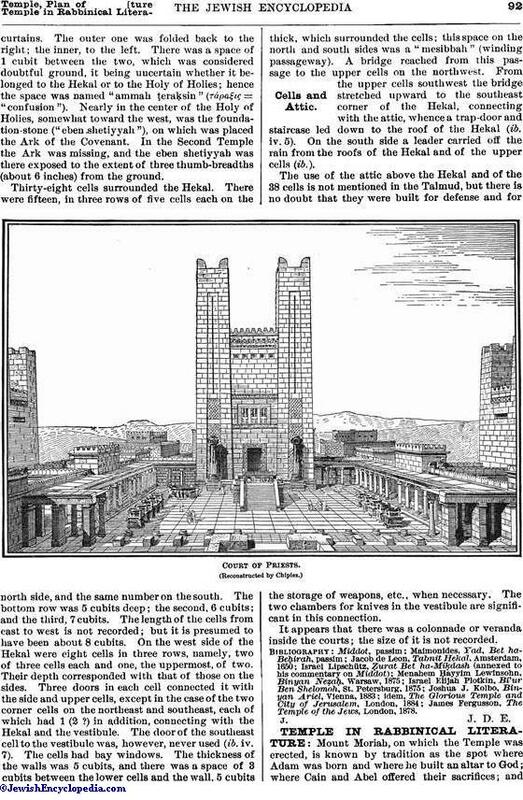 Solomon's Temple was an artistic structure of the highest conception. In its commanding position on the mount, in the pleasing effect of its white stone ornamented with cedar-wood, and in its symmetrical proportions it surpassed Herod's Temple, though the latter exceeded the former in mere magnificence. "One who did not see Herod's Temple missed seeing the most beautiful building in the world. It was constructed entirely of polished granite interspersed with dark-colored marble, with beveled edges, set in plaster. Herod even proposed to fill up the edges with gold; but the Rabbis advised him to abstain from doing so, as the white plaster combined with the granite and marble gave the Temple the appearance of waves of the sea" (Suk. 57b). 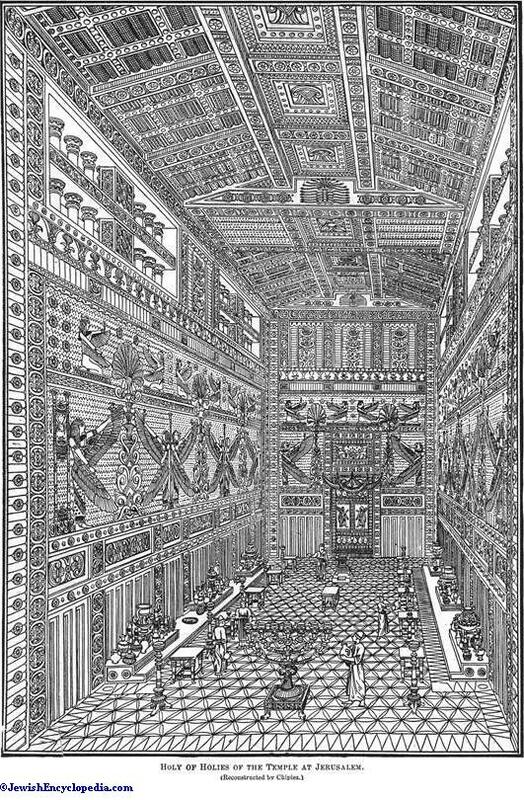 Thus it is evident that Herod was somewhat gaudy in his taste and that his Temple was less artistic in design and coloring than that of Solomon. Two views are expressed in commenting on the verse "The glory of this latter house shall be greater than that of the former" (Hag. ii. 8). 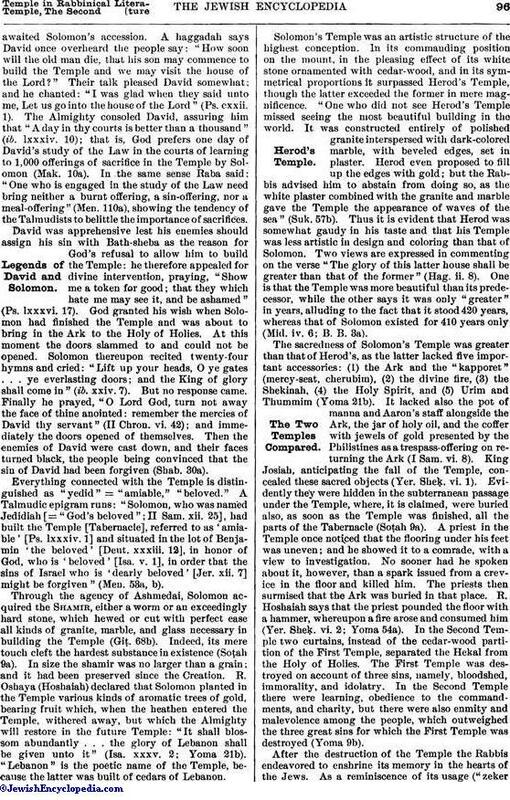 One is that the Temple was more beautiful than its predecessor, while the other says it was only "greater" in years, alluding to the fact that it stood 420 years, whereas that of Solomon existed for 410 years only (Mid. iv. 6; B. B. 3a). 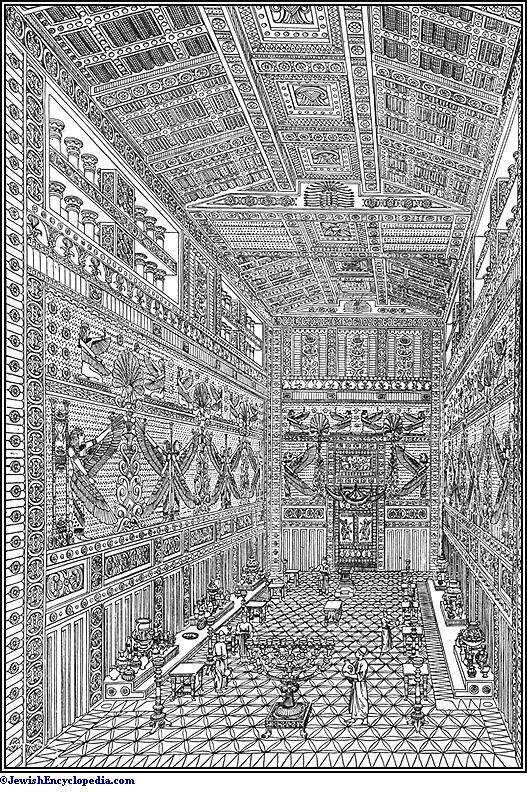 The sacredness of Solomon's Temple was greater than that of Herod's, as the latter lacked five important accessories: (1) the Ark and the "kapporet" (mercy-seat, cherubim), (2) the divine fire, (3) the Shekinah, (4) the Holy Spirit, and (5) Urim and Thummim (Yoma 21b). It lacked also the pot of manna and Aaron's staff alongside the Ark, the jar of holy oil, and the coffer with jewels of gold presented by the Philistines as a trespass-offering on returning the Ark (I Sam. vi. 8). King Josiah, anticipating the fall of the Temple, concealed these sacred objects (Yer. Sheḳ. vi. 1). 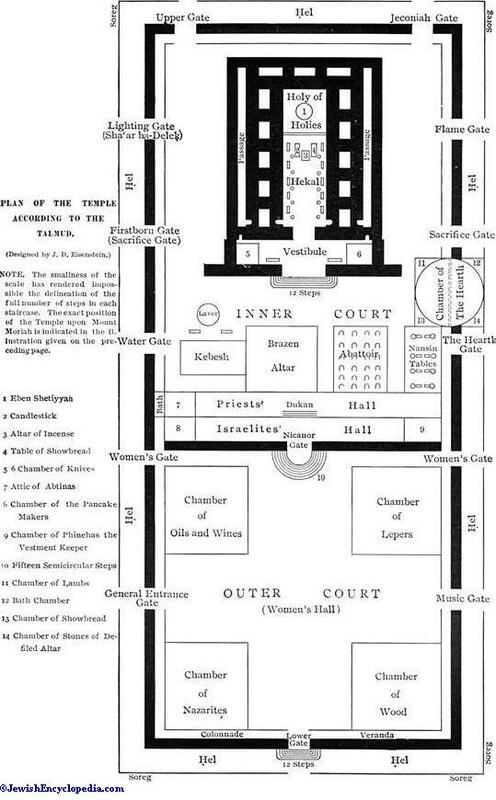 Evidently they were hidden in the subterranean passage under the Temple, where, it is claimed, were buried also, as soon as the Temple was finished, all the parts of the Tabernacle (Soṭah 9a). A priest in the Temple once noticed that the flooring under his feet was uneven; and he showed it to a comrade, with a view to investigation. No sooner had he spoken about it, however, than a spark issued from a crevice in the floor and killed him. The priests then surmised that the Ark was buried in that place. R. Hoshaiah says that the priest pounded the floor with a hammer, whereupon a fire arose and consumed him (Yer. Sheḳ. vi. 2; Yoma 54a). 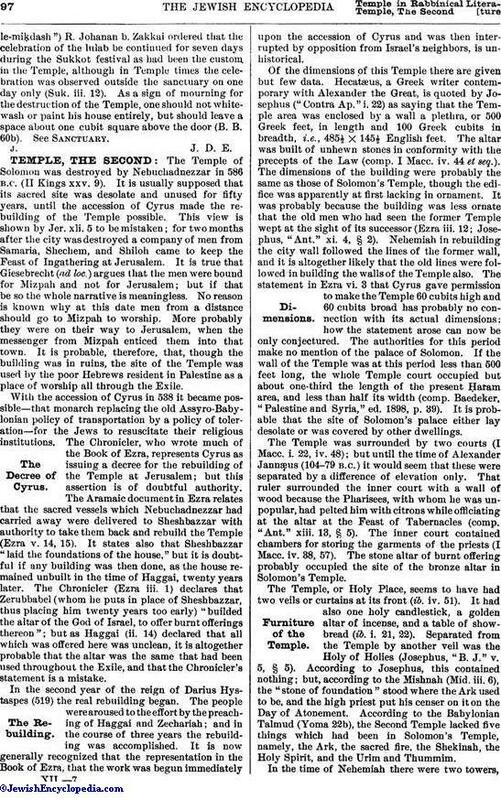 In the Second Temple two curtains, instead of the cedar-wood partition of the First Temple, separated the Hekal from the Holy of Holies. The First Temple was destroyed on account of three sins, namely, bloodshed, immorality, and idolatry. In the Second Temple there were learning, obedience to the commandments, and charity, but there were also enmity and malevolence among the people, which outweighed the three great sins for which the First Temple was destroyed (Yoma 9b). After the destruction of the Temple the Rabbis endeavored to enshrine its memory in the hearts of the Jews. As a reminiscence of its usage ("zekerle-miḳdash") R. Johanan b. Zakkai ordered that the celebration of the lulab be continued for seven days during the Sukkot festival as had been the custom in the Temple, although in Temple times the celebration was observed outside the sanctuary on one day only (Suk. iii. 12). As a sign of mourning for the destruction of the Temple, one should not whitewash or paint his house entirely, but should leave a space about one cubit square above the door (B. B. 60b). See Sanctuary.